Little ‘Stuff’ Counts as Clutter Too! I recently had the pleasure of moving. I love moving. It’s an opportunity for a new start in many areas of life. One, (and my favorite), is cleaning out the ‘STUFF’. I am always amazed at those teeny tiny things that accumulate. This is the ‘stuff’ that collects in bowls, jars, bins, boxes, drawers, and any other desirable container you have around your home that is ripe for ‘sticking’ stuff when you can’t figure out where else it should go. What kind of ‘stuff’ am I talking about? Things like (but not limited to): buttons, screws, samples, coupons, rocks, marbles, hooks, change, electronic pieces or adapters, pens, office supplies of all types, business cards, tiny notes to yourself, game pieces, legos or tiny toys, bread ties, wire, batteries, light bulbs, etc. Now, this type of ‘stuff’ may not take up much room, but it’s ‘stuff’. Stuff clogs our energy, our home, our productivity, and our life. 2. Go around your home in every container and favorite stashing spot, and empty them into this box. 3. Begin creating piles for different rooms or locations in your home (games, workroom, laundry room, sewing, etc.) from the ‘stuff’ in this box. 4. Throw ‘stuff’ away as you are sorting it. 5. Label the piles with ‘sticky’ notes so you don’t have to think. You can just toss items in their designated piles. 6. Enlist family members to put ‘stuff’ where is is supposed to live as you are going through this process. 7. If in doubt, I suggest tossing it (or good-willing it if it’s useful ‘stuff’). 8. Be sure to sort everything. It is best not to keep any trinket or item that you can’t decide on. 10. Make a ‘home’ for everything. A button jar, coin jar and battery drawer can all be helpful. Last, when you get something new, or you have a tiny piece of ‘stuff’ in your hand that you think might be useful in the future- RESIST throwing it into the nearest bowl or drawer. Put it where it ‘lives’. Things enjoy having a home too. I don’t know about you, but in a ‘paperless’ world, I sure get tons of paper! It comes in when I least expect it to: Mail, leaflets, newspapers, kids’ homework, marketing flyers, educational, promotional. The problem with paper is that you can accumulate a lot of it and become overwhelmed quite quickly. If there is something important that you need, it’s hard to find amidst the ‘junk’. 3. Do not politely take a flyer or tri-fold from someone. If you don’t want it, do not take it. It costs them money, and costs you sanity. 4. Recycle newspapers and magazines immediately after reading them. If there is something you want, want to remember, or want to refer to, tear out that page only and put in a ‘active’ pile or box. 5. Keep only things that are VERY important regarding kids’ homework and art. Have a ‘keepsake’ box, or hang it. You can’t keep everything. 6. When you meet someone, enter their information immediately into your phone, or have a business card folder in your car. That way cards and flyers aren’t floating around. 7. Get on ‘do not mail’ lists. There are plenty of them. All you need to do is google them. In addition, get OFF of mailing lists for catalogs. Many times you just call or shoot off an email. 8. Do not subscribe to magazines unless you have time to read them. 9. Have an active ‘pile’ or box and weekly make an effort to go through it before it gets out of hand. 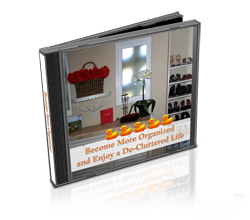 I guarantee, your life with be a lot less cluttered by taking some very simple steps. As I’ve said before, clutter comes in many forms. Financial, or ‘debt-clutter’ is another form of ‘stuff’ in our lives, that is not healthy. In this day and age, it seems impossible to talk to anyone who isn’t struggling with their finances. Some states are worse than others. I still have many friends in California who are struggling to make it, while still not paying their mortgage. What can be done when we are so far in debt and the future seems hopeless? 5. Pay for necessities with MONEY- or CASH. Many studies have shown when we use checks or credit cards we are removed from our debt. 5. Write down EVERYTHING you spend. That’s right. Even parking meter change. It’s amazing once it is all on paper. 6. Write down your monthly income and expenses. Know exactly how much you have coming in, and how much you have going out. 8. Be realistic. You may need to change your life-style. Rest assured, you will survive. 9. Do free things (or less expensive things) : Go to the library, take a walk or a hike, take a bus, carpool, swap clothing with a friend, cook at home, drink water from the tap. The idea is one of gratitude for all of the resources and things we do have. 10. Find resources on finances. Read a book from the library- check out budget planning on the internet. The most important thing is that you are committed to ‘de-cluttering’ your debts. This clutter isn’t as tangible as our ‘stuff’, but the weight of it can be as stifling. Clutter comes in many forms. In the U.S., and many other countries, it’s nearly impossible to escape. One must be present, aware, and live with intention in order to reduce the ‘clutter’ that surrounds us. In the months to come, different types of clutter will be presented, with simple solutions and suggestions. The first type of clutter that can be controlled is that in which we actually choose to put into our bodies. Fuel. That is food and drink. 1. Declutter your kitchen, including cupboards, pantries and refrigerators. Donate excess food, or toss expired items. 3. Prepare meals ahead for the week. Use a crock-pot and your freezer. This helps with impulse purchases and convenience foods. Always keep in mind everything has energy. Too much of anything turns into ‘clutter’. If our goal is to live a life in balance, this can not be accomplished if we surround ourselves with too much of anything. In my 25 years of ‘Organizing’ I have seen an amazing phenomenon. Clutter in our lives, and often in our heads contributes (and may lead to) clutter and chaos in our environments. With the advancement of technology, and the increasingly ease of acquiring ‘stuff’, this chaos is not going away. I feel it is safe to say that it is on the increase. It is all so closely linked, predictable- and cyclical. There is no easy answer- BUT- in my life, I feel I have been called to assist in changing these patterns and ways of thinking. Today I commit to blog, speak, write, teach, train and do everything in my power to aid in relieving humanity of this epidemic. Let us first start with BALANCE. We know it’s important, but how do we get there? This Photo will remain on my desktop as a motivator. Let the transformation begin! There have been numerous times in my life where I have created ‘unique’ storage ideas to hide or house ‘stuff’. Barnboyfurniture.com has been amazing when it comes to humoring me with my creations. That said, I was given this link by a friend and neighbor on facebook- (Bo Kelleher at Kaltura). I had to pass it on! I absolutely LOVE this idea! Each drawer is large enough to store useful things. It can replace your kitchen ‘junk drawer’, it can store all of that ‘stuff’ that goes upstairs, it is useful for flashlights or emergency equipment, AND, if looks great! Thanks Bo for passing this along! When we think of ‘clutter’ in our lives, we often think of the ‘stuff’. That is, the material ‘stuff’. The things we buy or collect. Let me suggest that people in our lives can be ‘clutter’ as well. Especially the ones who are toxic. Toxic people are those that walk around in a cloud of black. They carry around heaviness. You finish talking with them, and you feel exhausted. They may be negative, pessimistic, critical, and dishonest, love drama, or tell you about how much they have to do. Regardless, you know who they are. I had the distinct honor of meeting Don Miguel Ruiz the other day. He is the author of ‘The Four Agreements’, and a beautiful, insightful and humble man who carries great messages. He said something that was obvious, (and a bit humorous), but very difficult to grasp for some reason. When talking to his children about what to do about toxic people, he reminds them “YOU CAN WALK AWAY”. Wow! What a concept. It’s really that simple. Why stick around? Why expose yourself to that? What’s the point? Now, let’s take it a step further as Don did. When you are spinning around, taking on too much (and telling everyone about it), texting and tweeting and facebooking and emailing, happily engaging is the madness around you, maybe not being authentic or honest or living the life you were meant to- then YOU ARE THAT TOXIC PERSON. And as Don Miguel Ruiz simply put it- “You can’t walk away from you”. My experience had lead me to believe that most of our clutter begins in our ‘head-space’. Our outside immediate environment is simply a reflection of where we are at. If we have taken on too many commitments, are too busy, are texting, tweeting, facebooking, emailing, calling, holding onto resentments, fears, judgments, practicing negative thoughts towards self or others- basically, if we invite a lot of chaos into our lives- then it is quite probable that our head is a cluttered mess, as well as our environment. To begin, there are really only two basic rules we need to keep in mind. If you remember these, AND incorporate these into your lives every MINUTE, then both your internal and your external environments will be a lot less cluttered. 2. Invite only positive, healthy and loving things into your life. Living in Orange County California often required different types of organizing than living, say, in Wisconsin. Here, we have Earthquakes. Many of my clients have me create, and maintain an ‘Earthquake Preparedness Kit’ for them. I update it each year making certain dates on food and medication are current, and that batteries work. If you don’t have some type of box with things in ‘just in case’, you may want to think about it. We were in the epicenter of on a couple of weeks ago- it was only 3.9, but it got me to thinking about writing this as a blog post. Also remember to have an evacuation or safety plan for you and your family. Remember to check this kit annually.